Khan[b] (/kɑːn/) is a title of unknown origin for a ruler or military leader. It first appears among the Göktürks as a variant of khagan (sovereign, emperor)[c] and implied a subordinate ruler. In the Seljuk Empire it was the highest noble title, ranking above malik (king) and emir. In the Mongol Empire it signified the ruler of a horde (ulus), while the ruler of all the Mongols was the khagan or great khan. The title subsequently declined in importance. In Safavid Persia it was the title of a provincial governor, and in Mughal India it was a high noble rank restricted to courtiers. After the downfall of the Mughals it was used promiscuously and became a surname. The origin of the term is disputed and unknown; possibly a loanword from the Ruanruan language. According to Vovin (2007, 2010) the term comes from qaγan (meaning emperor or supreme ruler) and was later used in several languages, especially in Turkic and Mongolic. Turkic and Para-Mongolic origin has been suggested by a number of scholars including Ramstedt, Shiratori, Sinor and Doerfer, and was reportedly first used by the Xianbei. It maybe impossible to prove the ultimate origin of the title, but Vovin says: "Thus, it seems to be quite likely that the ultimate source of both qaγan and qan can be traced back to Xiong-nu and Yeniseian". "Khan" is first encountered as a title in the Xianbei confederation for their chief between 283 and 289. The Rourans may have been the first people who used the titles khagan and khan for their emperors. However, Russian liguist Alexander Vovin (2007) believes that the term qaγan originated among the Yeniseian-speaking Xiongnu people, and then diffused across language families. Subsequently, the Göktürks adopted the title and brought it to the rest of Asia. In the middle of the sixth century the Iranians knew of a "Kagan – King of the Turks". Various Mongolic and Turkic peoples from Central Asia gave the title new prominence after period of the Mongol Empire (1206–1368) in the Old World and later brought the title "khan" into Northern Asia, where locals later adopted it. Khagan is rendered[by whom?] as Khan of Khans. It was the title of Chinese Emperor Emperor Taizong of Tang (Heavenly Khagan, reigned 626 to 649) and Genghis Khan's successors selected to rule the Mongol Empire starting from 1229. Genghis Khan himself was referred as qa'an (khagan) only posthumously. For instance Möngke Khan (reigned 1251-1259) and Ogedei Khan (reigned 1229-1241) would be "Khagans" but not Chagatai Khan, who was not proclaimed ruler of the Mongol Empire by the kurultai. The title Khan rose to unprecedented prominence with the Mongol Temüjin's creation of the Mongol empire, the largest contiguous land empire in history, which he ruled as Genghis Khan. 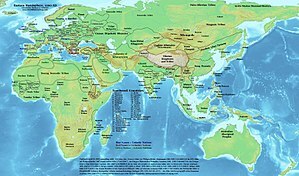 Before 1229 the title was used to designate leaders of important tribes as well as tribal confederations (the Mongol Empire considered the largest one), and rulers of non-Mongol countries. Shortly before the death of the Genghis Khan, his sons became khans in different dominions (ulus) and the title apparently became unsuitable for the supreme ruler of the empire, needing a more exalted one. Being under Uighur cultural influence, Mongols adopted ancient Turkish title of khagan starting with Ögedei Khan in 1229. Navaanneren, Minister of the Interior, who along with the 23rd Tushiyetu Khan Dorjsurenkhoroljav (1908-1937) was the last Khan in Mongolia. He was executed during the great purges of 1937. In southern Korean states, the word Han or Gan, meaning "leader", could be origin of word khan according to turkic history textbook. Geoseogan or Geoseulhan, the title of Hyeokgeose of Silla means "leader of leaders" and "king" in language of Jinhan confederacy. He was leader of saro state, one of the chiefdom of in Jinhan confederacy in 37 BC. After Silla, one of the Three Kingdoms of Korea, totally united them under a now hereditary king, titled Maripgan, meaning the 'head of kings' (e.g. King Naemul Maripgan). Khanzada (Urdu: خانزاده ‎) is a title conferred to princes of the dynasties of certain princely states of India. Khaqan or Khakhan (Old Turkic: 𐰴𐰍𐰣, kaɣan) (Urdu: خاقان‎) is used as a title in Pakistan. Khandan ('Khan holder') means "Family" in (Urdu: خاندان‎). Khan and its female forms occur in many personal names, generally without any nobiliary of political relevance, although it remains a common part of noble names as well. Notably in South Asia it has become a part of many South Asian Muslim names, especially when Pashtun (also known as Pathan) descent is claimed; it is now the most common Muslim family name in South Asia. It is also used by many Muslim Rajputs of India and Pakistan who were awarded this surname by Turkic Mughals for their bravery. Similarly it was awarded to Pashtuns by Turkic and Mongol kings. Also the name is claimed to be related to the Hebrew name Cohen or Kohen. ^ Khagan itself was borrowed by the Turks from the unclassified Ruanruan language. ^ The spelling with 'r' is due to a confusion with tartaros, the classical Greek hell. Genghis Khan's conquering, ransacking Mongol hordes terrorized Islam and Christianity without precedent, as if the apocalypse had started. ^ J. A. Boyle (1978). "Khāḳān". In van Donzel, E.; Lewis, B.; Pellat, Ch. ; Bosworth, C. E. (eds.). The Encyclopaedia of Islam, New Edition, Volume IV: Iran–Kha. Leiden: E. J. Brill. p. 915. ^ J. A. Boyle (1978). "Khān". In van Donzel, E.; Lewis, B.; Pellat, Ch. ; Bosworth, C. E. (eds.). The Encyclopaedia of Islam, New Edition, Volume IV: Iran–Kha. Leiden: E. J. Brill. p. 1010. ^ Shiratori, Kurakichi (1926). "On the Titles KHAN and KAGHAN". Proceedings of the Imperial Academy. 2 (6): 241–244. doi:10.2183/pjab1912.2.241. ISSN 0369-9846. ^ KRADER, LAWRENCE (1955). "QAN-QAγAN AND THE BEGINNINGS OF MONGOL KINGSHIP". Central Asiatic Journal. 1 (1): 17–35. ISSN 0008-9192. ^ René Grousset (1988). The Empire of the Steppes: A History of Central Asia now. Rutgers University Press. pp. 61, 585, n. 92. ISBN 0-8135-1304-9. ^ Carter Vaughn Findley, "Turks in World History", Oxford University Press, 2005, p. 45: "... Many elements of non-Turkic origin also became part of Türk statecraft [...] for example, as in the case of khatun [...] and beg [...] both terms being of Sogdian origin and ever since in common use in Turkish. ..."
^ Fatima Mernissi, "The Forgotten Queens of Islam", University of Minnesota Press, 1993. pg 21: "... Khatun 'is a title of Sogdian origin borne by the wives and female relatives of the Tu-chueh and subsequent Turkish Rulers ..."
^ Leslie P. Peirce, "The Imperial Harem: Women and Sovereignty in the Ottoman Empire", Oxford University Press, 1993. pg 312: "... On the title Khatun, see Boyle, 'Khatun', 1933, according to whom it was of Soghdian origin and was borne by wives and female relations of various Turkish Rulers. ..."
Chisholm, Hugh, ed. (1911). "Khan" . Encyclopædia Britannica. 15 (11th ed.). Cambridge University Press. p. 771. Karim, Abdul (2012). "Khan". In Islam, Sirajul; Jamal, Ahmed A. (eds.). Banglapedia: National Encyclopedia of Bangladesh (Second ed.). Asiatic Society of Bangladesh.